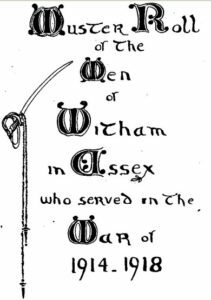 First World War in Witham. 13. 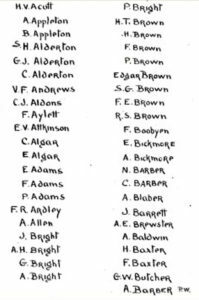 Witham Muster Roll, with those who served and survived. The first three pages and the last one are copies of the original. The rest is typed. C A North A Parker jun. G H North A Parker sen.
A Stoneham G A Stock P.W. E Shelley P.W. E W Thompson P.W. The author of the first poem, William E Henley, was very well-known in late Victorian times. 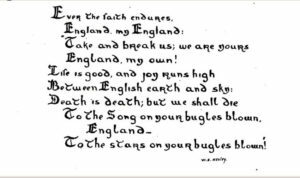 The last poem, by Beatrix Brice Miller, was first published in the Times in 1916 and became very popular. During the War she had been a nursing helper in France. Next Next post: First World War. 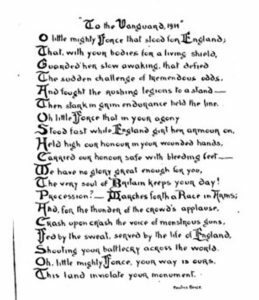 14. the Roll of Honour, with all those who were killed.